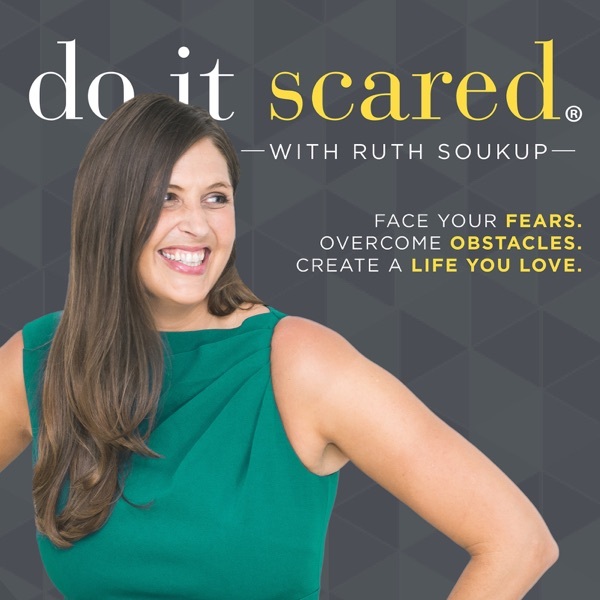 Do It Scared® with Ruth Soukup is the podcast created to help you face your fears, overcome adversity, and create a life you LOVE. Each week you’ll discover actionable strategies for greater productivity, motivation, entrepreneurship, creativity, fulfillment, success, and happiness, along with the motivation and encouragement to actually start making real changes that lead to big results. Each week we’ll address topics that delve into those things that we are so afraid of, and how it holds us back in our day to day lives—then focus on easy-to-implement advice for how we can face our fears and overcome adversity in order to create a life we truly love. The podcast will also feature bi-weekly interviews with authors, influencers, and other notable guests who have dared to do it scared in their own lives. Each of us has a fear archetype that shows how fear manifests in our lives and affects what we do. Knowing which of the seven fear archetypes describes you helps you identify your deepest fears, which is the first step in growing past them! You’ve heard that the darkest hour is just before the dawn, but did you know this is true in blogging too? Today’s guest, the amazing Faith Mariah, almost quit blogging just a few weeks before making a full-time income. Tune in to get seriously inspired! Have you ever started comparing yourself to other people, and ended up in the spiral of self-doubt and inadequacy? I’ve been there often, and I’ve discovered tools and techniques to help you break free! Taking a giant leap of faith can be easier when you have nothing to lose, as Pinterest maven Kate Ahl knows all too well! Today, she’ll dive into how she started her business, got past her fears, and created her amazing life. Achieving big goals and dreams is hard. Achieving them without support from your friends and family can feel impossible! But I promise you can do it, and I’ll explain how you can make your dreams a reality even if no one believes in you. What if I told you that losing weight doesn’t need to involve feeling hungry and deprived? Nagina Abdullah is living proof that you can lose weight, get in shape, and enjoy yourself along the way, and she’s here to share her tips! To create the life of your dreams, start by figuring out exactly who you are! Gretchen Rubin explains that each of us is born with one of four tendencies that shape our responses to expectations. Once you know your tendency, you can work within it. We’ve all heard that you need to love yourself to truly love others, but how can you love yourself when you know you’re flawed? Lisa Leonard, today’s guest, explores the power of finding the courage to love, even when that love is messy and imperfect. Do you make enough time in your busy life to truly practice self-care? You probably don’t, and you might even feel guilty at the idea of taking time for yourself. Self-care is actually one of the least selfish (and most important) uses of your time! Sometimes you need to be broken down so you can build up a better version of yourself. Today’s amazing guest, Michael Sandler, is the perfect example! His two near-death experiences helped guide him into sharing his inner light. Here at Ruth Soukup Omnimedia, we live, breathe, and work by seven powerful core values. Instead of talking about this by myself, two of my amazing, inspirational employees join me today to share how these values have transformed their lives! Your identity as a mom is incredibly important, but it can also be incredibly limiting. You aren’t just a mom, after all! Randi Zinn dives into how you can balance parenting with your own passion and purpose, and reclaim your sense of self. It’s hard to accept criticism! Nobody likes hearing that they’re making bad decisions, or going down the wrong path. But constructive criticism, controversy, and sometimes even conflict aren’t only inevitable; they’re necessary and valuable! Don’t let your challenges become your excuses! All of us have our struggles, but success means moving past them. Justin Heller, today’s guest, is a perfect example of how finding the good within the bad can lead to a life you’ll love. Success isn’t just about commitment and following through; it’s also about setting yourself up to succeed! Don’t let the new year catch you by surprise. Instead, take the last couple months of 2018 to lay the groundwork for your best year yet! Sharing your truest self with the world is scary! It’s also one of the most powerful things you can do, and a huge step down a path toward the life you were born to live. Cathy Heller shares her inspirational story and some incredible words of wisdom. One simple key trait separates those who succeed from those who don’t. It’s not about your finances, connections, or grades. Instead, it’s your grit! Your perseverance and determination to keep going no matter how hard things get is invaluable. Ready to write your own story and create your own narrative? Laura Belgray is a powerful copywriter and an entertaining person who knows all about forging your own path, even when you can’t always see the bigger picture. Making the decision to own it no matter what, and take full responsibility for whatever life throws your way, might just be the most courageous thing you’ll ever do! It isn’t easy, but it will change everything for you. Almost all of the world’s most successful people attribute their success to one of six practices, which you can combine into one morning ritual. Today’s guest, Hal Elrod, explores how you can transform your life using these practices and more! No matter how great your life is and how successful you are, comparing yourself to others makes it so easy to forget to celebrate your journey. Learn three powerful tools to escape the trap of comparison and get back to loving your life! Imagine a mom of six kids trying to change the beauty and fashion industry, and succeeding! Katie Driscoll has done exactly that, through her inspirational work to encourage major companies to feature people with disabilities in their advertising. Parenting isn’t easy, and raising independent, self-sufficient kids is even harder! In this episode, I go against the current trend in the United States. Instead of protecting your kids from everything, it’s important to let them fail! Here’s a counterintuitive piece of advice: in your business, pay yourself first instead of last! If this doesn’t make sense, you’ll love this conversation with bestselling author Mike Michalowicz about profit, fear, and killing your ego. Creating a life you love isn’t always easy! There will be times when it’s hard, frustrating, miserable, and downright scary. This is why it’s so important to have a “why” that’s bigger than your fears to keep you motivated and inspired! Every single one of us has a really good excuse for why we “can’t” create a better life. But those excuses are just holding you back! When Allison Toepperwein was diagnosed with early onset Parkinson’s, she faced it head-on and forged her own path. Even a good excuse is still an excuse, and excuses will never get you to where you want to be! Instead, take charge of yourself, commit to a no-excuses mentality, and see for yourself how amazing a life without excuses can be! Sometimes, the painful and challenging things that happen in our lives turn out to be exactly what we needed! Tess Masters, or the Blender Girl, used a tough situation to create fearlessness and learned to say “yes, and…” to life! Imagine having a high-powered career as a partner at a law firm, then giving it all up to pursue your passion for interior design. That’s what Tasha Agruso did, and she’s loving her life as an online businesswoman! Tune in for her inspirational story. Losing weight is hard! But the self-confidence that comes with loving your body is incredibly valuable, and can make huge differences both in your personal life and at work. That’s why I’ve created a four-step plan to losing weight and getting in shape! One way to move past rejection is to become so good that they just can’t say no! Edie Wadsworth figured this out, and used her determination to flourish in two impressive careers. Learn how to overcome obstacles, switch paths, and Do it Scared! We’ve all heard that the key to a successful, happy life is achieving balance. Would it surprise you to learn this isn’t true? Believe it or not, balance is overrated, and the concept can actually stand in the way of achieving a life you love! Rules are for suckers! If that idea surprises or shocks you, this episode is for you. Tune in to learn three principles that will help you figure out which rules to break shatter as you create a life you’ll love! Don’t get hung up on the fact that you don’t know exactly what to do! Trying something is at least moving forward. Ruth’s guest, Rosemarie Groner, turned this philosophy into a $100,000/month blogging success story, and shares her wisdom with listeners. Even those people who seem to live perfect lives actually face obstacles and breakdowns. The trick isn’t to have everything go right, but rather to turn obstacles into opportunities and breakdowns into breakthroughs! When you run into an obstacle, don’t be discouraged! Ruth’s guest in this episode, Ryan Holiday, digs into why obstacles are actually advantages and other surprising and unusual insights, like the idea that talent outweighs passion. Imagine how different your life could be if your inner voice exclaimed “Yes, I can!” rather than “No, I can’t.” In this episode, Ruth shares three powerful strategies that will help you overcome your own limiting beliefs and change that inner narrative. Ever feel like you don’t know what you’re doing? You’re not alone! In fact, just about everyone feels the same way. Ruth and guest Susie Moore explore how understanding this idea frees you to create the life of your dreams. The only ideas worth pursuing are those that not only excite you but frighten you as well. In this inaugural episode, Ruth gives you permission to dream bigger than you ever thought possible and shares four practical steps to make it all happen. In this introduction episode, we talk about what it actually means to Do It Scared™, and what this podcast is all about!